Land use policy can push for an inclusive city. Ours does not. Land use and zoning tools are too often use to limit new homes and new affordable homes. Can we make land use policies that encourage inclusion? Image by Elvert Barnes licensed under Creative Commons. DC’s Comprehensive Plan is a land use and policy document that is supposed to be a guide for inclusive growth in the coming decades. Unfortunately, it has too many parts that, in the hands of exclusionary and anti-development neighbors, are the means to push all of DC’s growth and change onto other, typically poorer, parts of the city. It doesn’t have to be this way. Recently we, along with a diverse group of housing stakeholders, submitted a package of amendments to the Comp Plan that attempts to remove this problematic language and replace it with language that promotes inclusive neighborhoods everywhere. Land use policy in DC has history of outright racism and exclusion. Not too long ago property owners in some neighborhoods used racial covenants to keep out minority neighbors, placing clauses on deeds that explicitly forbid rental or sale to African Americans and other minorities. I’m not talking about that kind of explicit legal exclusion. I’m talking about embedded and problematic language in our current land use policy and the way it is used by those with more power and privilege. There is a persistent system here. You can choose to not see it that way and read these policies as neutral, but I think that ignores systematic patterns of exclusion, segregation, and a fundamental imbalance of power and resources when it comes to the enforcement and use of land use policy in DC. To see this map, click it, then select Layers, then Demographic, then Neighborhood Composition. Image by Office of Planning. To see this map, click it, then select Layers, then Demographic, then Estimated Black Population - 2010. Image by Office of Planning. 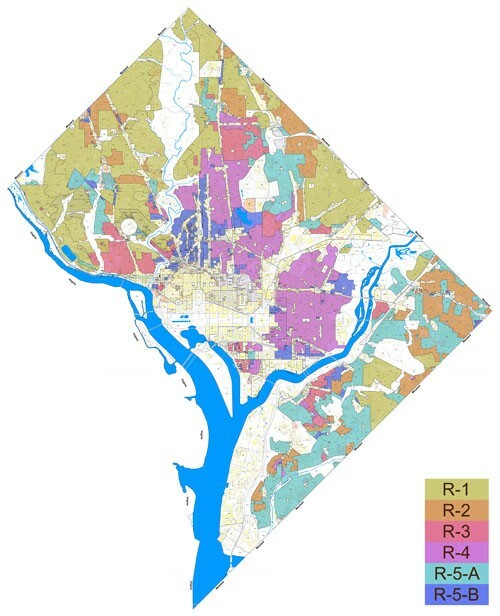 The Comp Plan map labels DC neighborhoods as “stable,” “transitioning,” “emerging,” and “distressed,” terms the Office of Planning uses based on demographic and market data. Comp Plan policies attached to each of these categories guide development in the area and help determine the future of that neighborhood. The Comp Plan map is not a redlining map; it does not explicitly segregate the city. But it’s not too hard to see that it also does not support integration. It is not that labeling neighborhoods is wrong. What is wrong is calling predominantly white and wealthier neighborhoods “stable” and then providing policies and defensive language in the Comp Plan that, when utilized by a few land use activists from these more privileged neighborhoods, ultimately furthers these exclusionary patterns. Framework Element 217.6: Redevelopment and infill opportunities along corridors and near transit stations will be an important component of reinvigorating and enhancing our neighborhoods. Development on such sites must not compromise the integrity of stable neighborhoods and must be designed to respect the broader community context. Framework Element 218.1: The residential character of neighborhoods must be protected, maintained and improved. Many District neighborhoods possess social, economic, historic, and physical qualities that make them unique and desirable places in which to live. These qualities can lead to development and redevelopment pressures that threaten the very qualities that make the neighborhoods attractive. These pressures must be controlled through zoning and other means to, ensure that neighborhood character is preserved and enhanced. I can easily see how some neighbors have been able to consistently use documents like the Comp Plan to reduce or push away development projects. Of course we should have attractive neighborhoods, but if that neighborhood does not offer housing options that are affordable to people of many incomes, what should be done? Do we just accept that and ask lower-income or moderate income folks to go live elsewhere? Or do we try to find ways to incorporate diverse housing types and affordable options into these stable neighborhoods, creating opportunities for others to access and enjoy the neighborhood? That’s a hard ask, and solutions need to be considered carefully. But it seems unfair to me to just throw up our hands and accept the status quo. We could prioritize inclusion. Here’s what that might look like. Last month, after over nine months of work with a broad set of housing and development stakeholders, Greater Greater Washington helped to submit a package of amendments to the Comp Plan that specifically targeted this exclusionary language. We believed there were ways to talk about “neighborhood character” without making neighborhoods exclusionary to people of middle and lower incomes. Whenever we found this kind of language, we worked to adapt it to maintain its intended message while also de-weaponizing it as a tool of exclusion. Amendment 1-1-1 - Framework Element 217.6:​ Redevelopment and infill opportunities along corridors and near transit stations will be an important component of reinvigorating and enhancing our neighborhoods. Development on such sites must respond to and enhance existing neighborhoods, respect the broader community context, promote diversity of housing types, accommodate needed housing, particularly affordable housing, and affirmatively further fair housing. Adequate infrastructure capacity should be ensured as growth occurs. Enhancing beautiful neighborhoods and building more opportunities for people of all incomes to live there does not have to be in conflict. If you think they are, I think you and I are going to have some more fundamental disagreements about neighborhood character, race and class. We hope our amendments reprioritize inclusivity in our land use policy, and give both District agencies and advocates the tools needed to effectively push back on these patterns of exclusion. With my background as an community organizer, when I first saw this map it looked like something else to me: a map of power. Those who have a lot of power tend to live in lower density zoned areas, and those who have less of it live in higher density zoned areas. And what I’ve learned in my time with GGWash has verified this; those with power and privilege much more often wield the tools of zoning and land use to protect their interests, which leads to pushing away new development, new residents, and affordable housing. Maintaining a restrictive lower-density neighborhood helps maintain a cap on the supply of homes there, ultimately leading to higher prices. That’s great for those who already live there, but it makes it more difficult for moderate and low-income people to join them. Again, solutions to opening up lower-density neighborhoods to people of a wider spread of incomes need to be thought through carefully. But we need to have that conversation, and we need to address the problematic land use tools that neighbors with more power and access keep using to “protect” their neighborhood.